María Eva Duarte de Perónf (7 May 1919 – 26 July 1952) was the second wife of President Juan Perón (1895–1974) and served as the First Lady of Argentina from 1946 until her death in 1952. She is often referred to as simply Eva Perón, or by the affectionate Spanish language diminutive Evita, which literally translates into English as "Little Eva". Known to be the unofficial representative of los descamisados, or the “shirtless ones”, for her role in helping the underprivileged, poor, and working class in Argentina, she became a national hero. By the age of 32, she was to run alongside her husband as his vice president, but she was forced not to accept the nomination. Madonna portrays her life in the 1997 film called Evita, which brought her back into the public consciousness. Although she was the youngest of five children in the Duarte family, she was known to have a passion for life and an unsurpassed desire to help those around her. With her desire to be an actress, she moved to Buenos Aires just after turning 16 years old. Her acting career went better than some who had had formal training. She never made it into bigger motion pictures, but was hired to work regularly for various radio stations around the city. When she met her future husband, Colonel Juan Peron, the Secretary of Labor, she had no idea that her role as a national figure would inspire millions of people. Peron, who had also been recently widowed, saw how much assistance and devotion Evita, as she was often called, would give to his campaign to become president. Gaining the backing of workers’ unions, Peron was on his way to the candidacy. When Evita helped organize a protest to free Peron from being jailed, he knew that she had the pizzazz necessary to help him win the presidential race. Within just a few days, Eva Duarte became Eva Peron. With the active help of his new wife, Colonel Juan Peron became President Peron in 1946. Eva’s growing popularity among the less-privileged groups won them unparalleled support. With Juan Peron as president, Evita began many programs of social welfare and reform, increasing her and her husband’s popularity among the masses, and less so with the social elite. Evita supported union workers’ rights and requests for higher wages and higher safety standards in their factories. Many claimed that Eva’s social background is what inspired her to help those less fortunate. Some even used these claims to state that she was unfit to influence other decision makers and hold the positions she did. But, the bulk of Argentine society couldn’t have loved her more. She soon set up the Maria Eva Duarte de Peron Welfare Foundation, and within the first year of her husband’s presidency, she raised millions to help start schools, orphanages, hospitals, and food centers to help those who needed it most. With all these contributions she made to society within the first years of her husband’s presidency, her husband would undoubtedly steal another presidential victory. Evita was nominated to run beside her husband as Vice President, but had to decline when she learned she had cancer and would pass away shortly. At the age of 32, Eva had done more for Argentine society than any other and died in July of 1952. 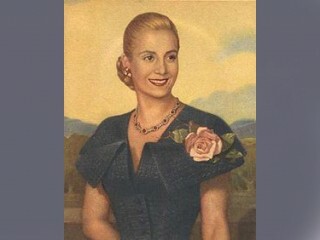 View the full website biography of Eva Perón.